I can’t believe we are going to miss this! | Head's Hate Blog! While researching where the McDonalds of Northern Italy and Austria are, I stumbled across this news. Leave it to the good people of Austria to beat us at our own game. The McRibster sandwich!!!! Chomp! Unfortunately, it will be gone a week before we play Innsbruck. 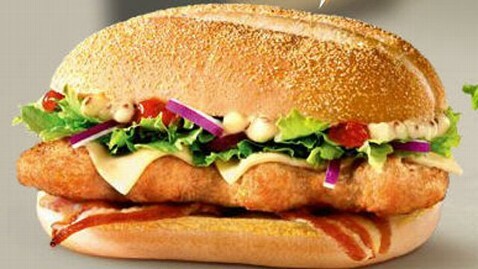 For a limited time, McDonald’s locations in Austria are featuring the McRibster, a breaded, fried McRib that’s topped with pepper-jack cheese and bacon. With two sauces – a sweet chili and a honey mustard – the sandwich is garnished with lettuce and red onion. It’s only available until March 27th. 3 Responses to I can’t believe we are going to miss this! Does it come with a Chocolate Overlord dessert? that’s a dynamite question, Dustin! Oh, I can’t wait for the 100% Rindfleich Dopplepack! Ja, gutes essen, ermutigenden bereicherung!! !